INGREDIENTS: UPROTEIN 100% Whey Protein Hydro + Enzymes Blend (96%) (Instantised Whey Protein Concentrate, Instantised Whey Protein Isolate, Whey Protein Hydrolysate, Proteolysis Digestive Enzymes (Papain, Bromelain), Anticaking Agent, Socially And Environmentally Responsible Cocoa, Natural Flavour, Acesulfame K, Sweetener (Sucralose). Contains milk, soybean products. Soybean products (Soy Lecithin) is used to instantise whey proteins and is less than 1% of the whey product. Made in Australia from local and imported ingredients. Halal and gluten free ingredients. I've recently purchased this product but prior before I was spending quite some time online looking at the top ten protein and then doing some individual research on them"Quite some time" is an understatement. I really enjoy the flavour (Custard) and most important I like it how it doesn't leave you full or bloated that you can't eat afterwards which was one of my problem. Top site, easy to digest, great flavour and best value. Thanks. Excellent quality protein powder and great taste too from the vanilla custard! Quick delivery as well. I didn’t know what to expect when ordering the vanilla custard Flavour, however after trying it I love it so much. Paired with other supplements, I have now created the perfect scenario for the most effective changes to my body. 100 percent satisfied with this product, would highly recommend to anyone looking for muscle and repair . After using Uprotein Mass gainer to put on mass, I needed something to shred down the fat without compromising muscles gains. Whey protein hydro is delicious, smooth and affordable that provides me with enough protein to supplement my diet without leaving me bloated and gas problems. One of the cleanest and nutritious protein I have ever had, literally introduce my mate to this product and ordered another 2 bags. This is hands down the best protein product I've had. Delivery is easy and quick, the flavour (I have the banana sundae) is great and the smooth texture with no grainy bits or lumps makes it easy to drink. This drink doesn't make me feel bloated afterwards as well, and at approx $1.40 a serve from the 2kg bag it's not hard on the wallet either. 5/5 Uprotein team. Terrific product in terms of Protein content to Carb totals. Very easy to consume with great taste. Highly recommended and will purchase again for sure. 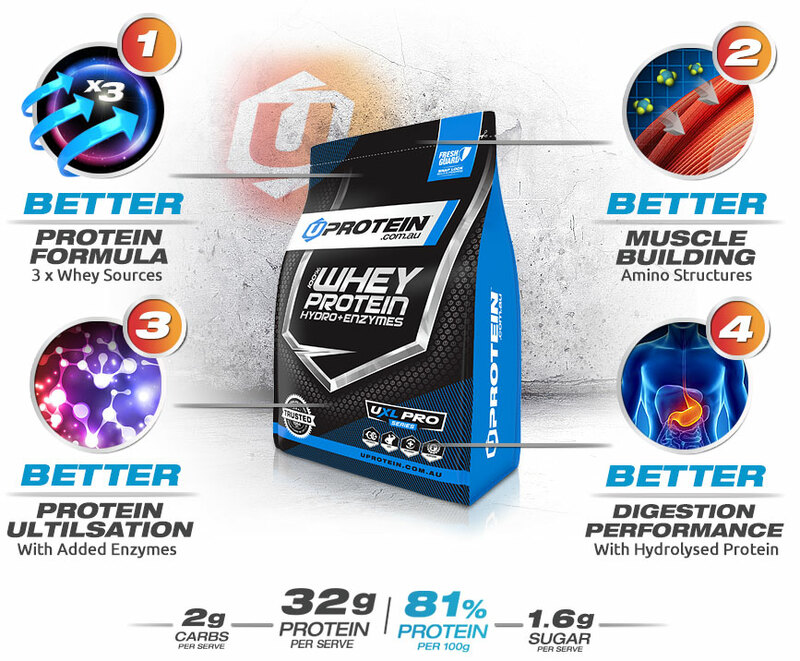 I have tried a lot of proteins in the past but I must say I am really enjoying the protein I purchased from uprotein. Flavour is great and it seems to mix effortlessly. Thank you. Taste is pretty good - the only annoying thing is having to deal with a serving size that is 40 g (meaning you need two scoops of protein for one serving) when most other protein products just have the one scoop. It's good value compared to other products out there, but the shipping fee was also a hassle. 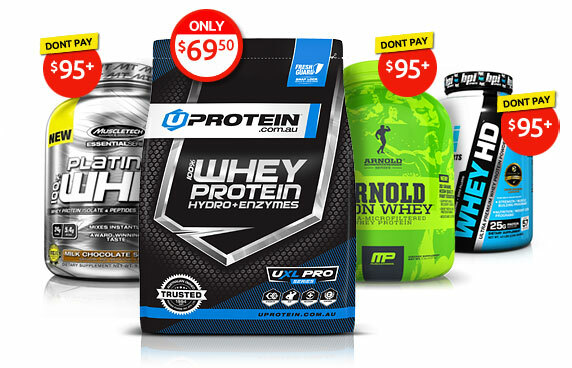 If I'm spending over $50 on just protein powder it's annoying to pay an extra $8.50, annoying enough that I don't know if I'd purchase again if I can find something similar elsewhere. Banana, Blueberries, Raspberries and 2 scoops of this delicious protein.. Best I've ever tasted, salivate after my workout. I Bought this product last week and it tastes great( Choc brownie ). I will be buying more as it's good value and taste and easy to order and delivered in a few days. Ordered it on Monday and got the pack on Wednesday, everything was packed so damn neat I nearly felt bad taking it out of the box. 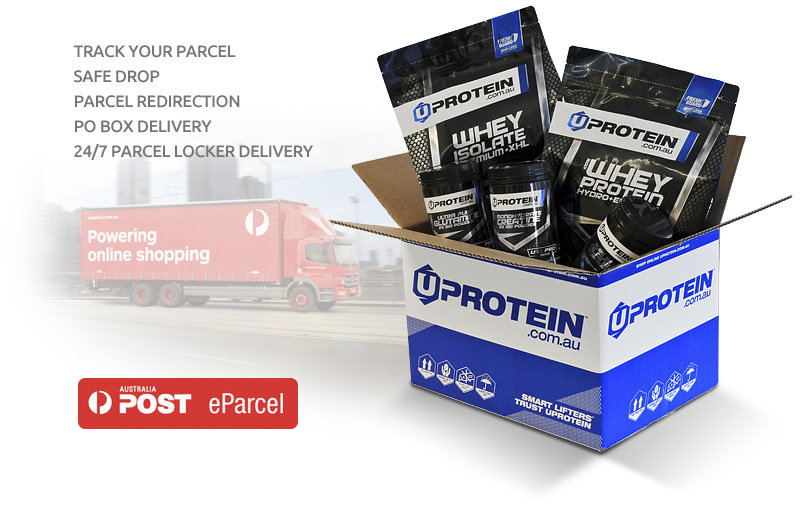 Probably best value for money protein in Australia. I was reluctant to buy this protein powder as other brands I had tried were not nice to drink. 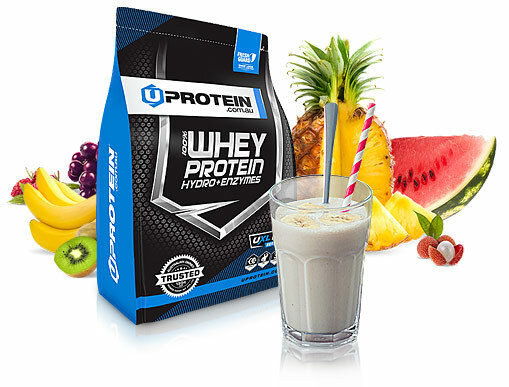 UProtein however is easy and enjoyable to drink. It also is giving me the physical capabilities I am after. Will buy this product again and probably in a bigger bag next time now I know what it is like. I am a first time user who was looking for the right protein product. I researched and it has paid off. Everything that is promised is delivered. Great flavour and decent amount of protein. Bit light on the calories though! I like it. We like it. You'll like it. Worth it. Buy it. Simple- I had 5 stage spine surgery reconstruction/fusion. Needed high protein uptake for recovery, but had NO appetite. This was a good bridge until regular eating habits could be established. Loved the Vanilla Custard. 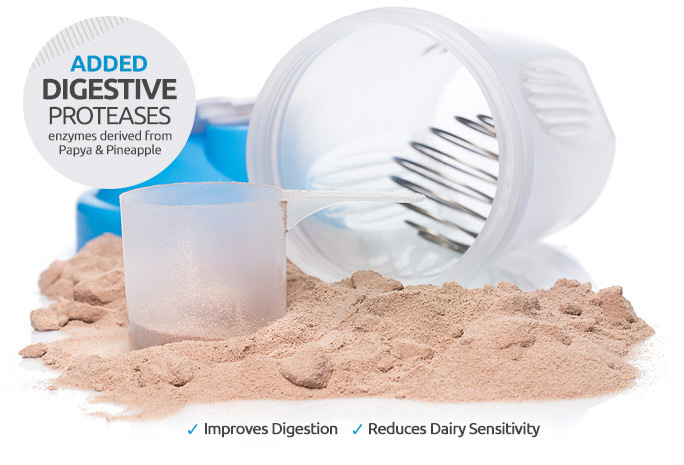 I was drawn to this product because it is so much more affordable than other protein powders and was recommended to me. I can only go by the taste and the trust in its independent test to confirm protein content. So, after passing the budget test, I’m left with the taste to critique. I got the chocolate fudge; I mix it only with water and two scoops and it’s palatable and not too bad. Don’t over shake it because it does froth and mix pretty well. Bought this product after much research and review reading. As a change up from my usual brand. Was not disappointed. Easy to purchase great & turnaround time on delivery. Great flavour easy to mix. Will happily purchase again. Honestly, I know I've heard and read good things about this product but I just didn't expect to be *this* good. I'm not super duper full, the flavour (chocolate) is nice (although I want to try the tropical one next) and honestly the recovery time after the gym has cut down dramatically, I am pleasantly surprised. Used many 'imported' ones, but this is only one I needed. I have just started taking upprotein and I dont feel too much sore muscle the following day after a heavy workout. Choc brownie tastes good, cheapest protein powder available. Choc brownie tastes good, even with soy milk (ran outta regular milk). Doesn't make me feel sick unlike other protein powders. 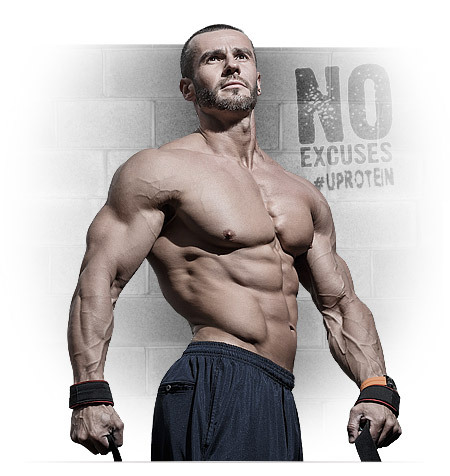 In the short time I have been taking Uprotein, I have found that not only does it taste great, it is fast acting and really cuts my recovery time in half and allows me to hit the weights more often in comparison to the many other products I have tried on the market. Keep up the great work guys as I think I have found my future Protein powder of choice. Love the taste and the whey protein has already started to help me reach me goal only after 2 weeks. this whey protein is very good. i got the chocolate one which taste similar to an up and go just not as sickly definitely nicer just gives you bit of an idea. i also like that you dont have to have huge quantity as you only need to mix 250 to 300 mill of water or milk rather than the common 700 ml of milk or water. the high protein content is good. it is a good enhancer to use beside your normal diet so you dont have to eat a leg of ham a day to keep up the protein levels. the bag comes with a scoop. dont need to worry about the handling as it is as snug as a bug in a rug. and is dam well priced plus the free shipping sure is a plus. over all damn pleased. also mixes well and the extra digestive enzymes are a blessing. never feel bloated after having it. Very nice product. I love the high % of Protein per serve. Mixes well with water and digests well. Might be being pedantic but I think the flavor could be listed somewhere other than on the bar code at the rear of the packaging. Appreciate it probably saves money to have them on an adhesive sticker rather than the bag itself. The marketing page for this product was extensive and exhaustive. Whilst I waited for the delivery (which didn't take long at all) I was concerned it was all talk and no walk. But those fears were misplaced. Not only is this product at the top of its class it is everything the company promises it will be. I bought the vanilla flavour and was immediately impressed with the taste. Not too sickly like other powders which means you can load up your smoothies to hit your protein macros without sacrificing taste. Another benefit is its kind to the digestive system. Users of protein powder will acknowledge that often bowels can become irritated amongst other issues. To date I've experienced nothing like this and I have been taking 60g of this powder each day. But the important part is the results. In the short time I've been using I have noticed improvements to strength as well as visual results. Loading before a workout really helps with energy to see it through and post workout I definitely notice the recovery enhancements. Then there is the price. For 2kgs this price is more than affordable. Its cheaper than equivalent portions of chicken breast and goes down easier. An all round winner of a powder that talks the talk and walks the walk. Now I have faith my gains will be catered for. I love this protein as it’s so easy to drink and digests easily. I used to feel so bloated with previous brands I used so I bought the 2 Kg to try it. I will be buying this product and recommend to all my friends. The vanilla flavour is awesome. I tried out this protein powder because I was having issues with another brand that I had been using for a while. I started to sweat out the protein at night and I would wake up smelling awful in the morning. I did some research and the cheap protein powder I was taking had a lot of additives in it which caused this. I chose the UProtein brand as it seemed to have all the right ingredients and none of the crap stuff, whilst also not breaking the bank (which is important if taking a couple of shakes each day). It tastes great, mixes easily, definitely helps with my muscle recovery and lean muscle growth and most importantly, has caused no smell whatsoever. Highly recommend this brand, I won't be going back to any cheap and nasty protein powders. 5 out of 5 stars. This is a great tasting powder that I look forward to consuming. Feels like it is doing the job giving me a bit of an edge. I don’t regret the order and will definitely try some of the other flavours. Priced extremely cheap for what it contains! Various added extras that other brands will have you pay a lot more for! Can be mixed strong without becoming too thick or dilute without losing its taste! And obviously the percentage of protein by weight. My new favourite brand and website! Would recommend to anyone looking to increase their protein intake without breaking the bank! Does it work - UBET it does!!! Not only is it unbelievable value for $$ it tastes great (vanilla custard)!!! I feel awesome after drinking it post workout and my body is raring to go for another session. Great flavours and tasting protein. Would recommend it. 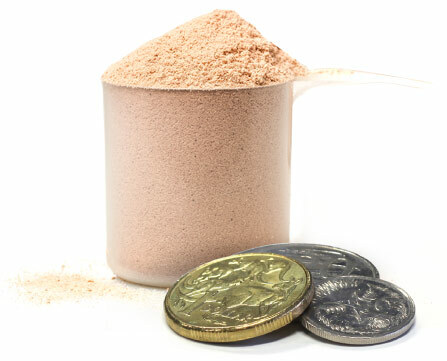 ✔ Our best selling formula - 2kg (4.4lb) is 50 Serves. Reward your body with a Superior 100% Whey Protein Powder formula. At around $1.25 per serve, this best-in-class formula is also Australia's best value. 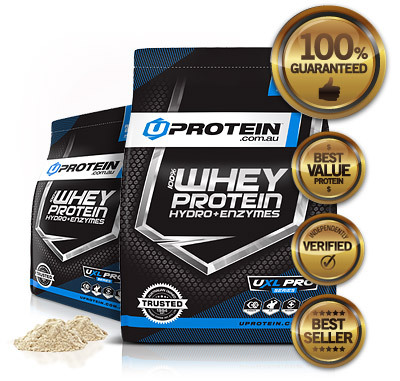 Now you can get premium 100% Whey Protein for significantly cheaper. We want you to love this 100% whey protein. If for ANY reason you are not 100% satisfied, we will happily refund the purchase price.